An advanced GF2, or a slim-line G2? Though the compact-styled GF1 proved very popular as a 'take-everywhere' camera for enthusiast photographers, its replacement - the GF2, left these users nonplussed. This was largely down to the fact that Panasonic simplified the handling, removed several of the direct control buttons (including the mode dial, drive mode switch, AEL and DOF preview buttons) and introduced touch-screen control. This may have been intended to appeal to novice photographers, but to enthusiasts it felt like dumming down. The modern-day classic reportage camera appeared to have been transformed into a happy-snappers model – albeit a very nicely built one. Panasonic's new Lumix DMC-G3, however, could be the camera that GF1 and G2 users want to upgrade to. It combines the compact camera styling of the GF-line with the more advanced handling and control of the mini-DSLR-like G-series. Even better news is that the Panasonic G3 has the G2's articulated, touch-sensitive LCD screen AND an electronic viewfinder, so there's no need to buy the option finder like with the GF2. 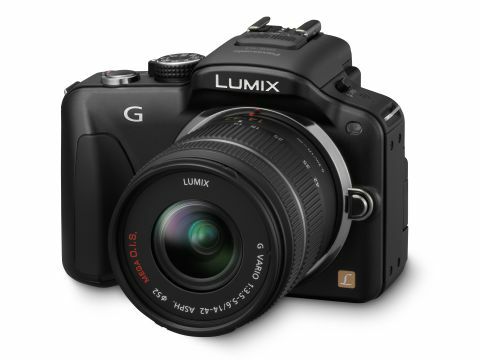 Like Panasonic's other G-series cameras, the G3 is a compact system camera (CSC) built following the Micro Four Thirds standard. This means that while the Panasonic G3 can accept interchangeable lenses with the Micro Four Thirds mount, it doesn't have a reflex mirror so the light that passes through the lens cannot be directed to an optical viewfinder. Instead, the scene is composed either on the LCD on the back of the camera, or in the electronic viewfinder (EVF). With Olympus's Pen cameras and Panasonic GF cameras, the EVF is an optional accessory, but it's built into the Panasonic G3. Doing away with the mirror and pentaprism enables CSCs to be made more compact than the average SLR. Panasonic has introduced a new 16.6-million-pixel Live MOS sensor for the Lumix G3, which uses novel circuitry. We are awaiting information about exactly what has been done, but Panasonic claims the new circuitry and noise suppression within the photodiode result in cleaner images. Interestingly, a firmware update on the eve of its launch pushed the G3's output resolution from 15.70 Mp (4576x3432 pixels) to 15.83Mp (4592x3448 pixels) and subsequently the G3 lists '16Mp' in its image size options. As a Four Thirds type sensor the G3 imagining device is smaller than an APS-C format sensor (for example 23.6x15.6mm in the Nikon D5100) and measures 17.3x13mm. Images therefore have a 4:3 aspect ratio, but the G3 can be set to 3:2, 16:9 and 1:1 format recording and crops the image accordingly. Because of the sub-full frame sensor, there is a 2x magnification factor on the focal length, so the 14-42mm kit lens produces a similar angle fo view to a 28-84mm lens on a 35mm camera or an 18-56mm optic on a Nikon APS-C format (DX) SLR. Meanwhile, the Panasonic G3 uses the same Venus Engine VI FHD processor as the top-end Lumix DMC-GH2. In the Lumix G3 this engine processes each image file in two ways and then combines the results to produce an image with lower noise levels. Low-light performance has been an issue for Panasonic's Micro Four Thirds cameras, and the G3's new sensor design is intended to improve the situation. However, in comparison with APS-C format DSLRs the top sensitivity setting of ISO 6400 seems a little low, while the lowest setting, ISO 160 is higher than usual. Despite the double processing, the Panasonic G3 is still capable of capturing full resolution images at a maximum rate of 4fps. When a Class 6 SDHC card such as a San Disk Extreme III is installed around 20 of the highest quality JPEGs, 7 raw or 7 simultaneous raw and JPEG files can be captured before the G3 slows down. If faster shooting required, the G3's Super High continuous shooting rate uses an electronic shutter rather than a shutter curtain to allow 40 4Mp images to be taken at 20fps. Although the Panasonic G3 is aimed at more experienced photographers than the GF2 is, there's still a collection of 17 scenes modes (including two baby modes) which tailor the image exposure, white balance and processing for specific subjects. They are useful when you're starting out in photography or want to keep things simple. In addition, Panasonic's Intelligent Auto plus (iA+) mode is on hand, with a dedicated button on the G3's top-plate. When mode this is in use the G3 selects what it calculates to be the most appropriate camera settings, uses its Intelligent Scene Selector to identify the right scene mode to employ and determines whether to activate the MEGA O.I.S (Optical Image Stabilising) and Intelligent ISO Control. The latter reduces motion blur by increasing the sensitivity if the subject moves as the shot is taken. Earlier Panasonic G-series cameras have a fully automatic My Color mode, which has been renamed Creative Control for the Panasonic G3. It allows the user to select one of seven preset image effects (Expressive, Retro, High Key, Sepia and High Dynamic) to apply at capture. When the Panasonic G3 is set to Creative Control on the Mode dial, exposure control is automatic, but the rear dial above the thumb rest provides access to the exposure compensation and Defocus Control functions. The later is a simplified control over the aperture. Experienced users are likely to prefer the Photo Style modes (previously known as the Film modes) to the Creative Control options as the Photo Styles can be used in any of the advanced shooting modes (PASM), and as in video mode. Panasonic has changed the names of the Film modes found on earlier G-series cameras to Photo Styles to reflect the increasing number of users who have never used film. As before, it is still possible to change the contrast, sharpness, saturation and noise reduction applied with the options: Standard, Vivid, Natural, Monochrome, Scenery, Portrait and Custom. There's no longer a Multi-Film or Multi-Style option to record a sequence of images with different Photo Styles applied though. As it's a mirrorless camera, the Panasonic G3 uses contrast detection for auto focusing rather than phase detection. While contrast detection is usually accurate it tends to be slower and less decisive than phases detection, but the company has been working on improving Panasonic cameras' AF response. With the Lumix G Vario 14-42mm f/3.5-5.6 ASPH MEGA OIS kit lens Panasonic claims the G3 can achieve sharp focus in an impressive 0.18sec, but with the Lumix G Vario 14-140mm f/4.0-5.8 MEGA OIS lens it peaks at a supper-snappy 0.1sec. Panasonic has also extended the coverage of the AF system so that it can now operate over the G3's entire imaging area and AF points can be position right up to the edge of the frame. In addition to the AF Tracking, 23-Area, 1-Area and Face detection AF modes we have seen before, the G3 has a new Pinpoint AF mode. When this is selected the AF point can be positioned anywhere on the LCD with just a touch of the finger. It's similar to 1-Area AF, but a key difference is that the target area is magnified on screen as the shutter release button is depressed so that you can check the correct part of the scene is sharp. It could prove useful for a range of situations, such as shooting still life or landscape images. No CSC or DSLR is complete without video recording capability these days and the G3 can shoot full HD (1920x1080 pixel) as AVCHD or Motion JPEG files, output at 30fps or 25fps. Full time AF and AF tracking is available during filming, something which isn't available in Panasonic's flagship GH2. Provided that it can produce sufficiently detailed, clean images the G3 seems very attractive and has plenty of features that will appeal to enthusiast photographers. Controls such as the Touch AF and Touch shutter which enable the user to just touch the screen to activate focusing or activate focusing and fire the shutter allow images to be taken much more easily from unusual positions. It's also great for street and candid photography as the photographer can face away from the subject and avoid drawing attention to themselves. While many may prefer an optical viewfinder, at least the G3's electronic finder is built in and isn't an optional extra. There's also a pop-up flash (guide number 10m @ ISO 100) as well as a hot shoe to accept an external flashgun. It is a little surprising that Panasonic hasn't found room for an eye sensor to detect when the EVF is in use and a built-in electronic level though.